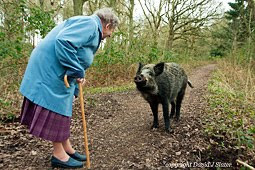 It's been 9 years since a (still) unknown person released approximately 60 wild boar into the Forest of Dean in November 2004. Over these years, both professional and amateur conservationists have speculated upon the potential problems that wild boar may create with regards a few species of animal and plant. First was the worry about wild boar digging up bluebells here in the Forest of Dean, a location that shows off an amazing spectacle of these endangered plants each year in May. But as always, it isn't just the experts that speculate, because as soon as a potential problem is mooted in the local press or on an equally ill-informed social networking forum, the public who do not like the boar are quick to condemn. Friends of the Boar would like to assure its followers that we do not jump to any conclusions without first considering facts and published scientific evidence. In the case of bluebells, what seemed a plausible concern, after 9 years of close observation, we can conclude that bluebells are not under any threat at all. In fact recent research in 2011 by Defra confirmed that wild boar do not threaten the bluebells (Harmer, Straw and Williams, Royal Forestry Society Quarterly Journal of Forestry, July 2011). And then we have had some concerns from Butterfly Conservation regarding wild boar digging up larval food plants of several species of butterfly, the most prominent of which are wood white and grizzled skipper. But Friends of the Boar are not complacent in this research either, and we have spoken to a few branches of Butterfly Conservation that have both these butterfly species and wild boar on their reserves. To date, it would seem that wild boar have had no detrimental influence on these butterfly species, but may in fact be enhancing the populations. The Sussex branch of Butterfly Conservation have been in contact and they say that they have been holding both Wild Boar and Grizzled Skipper walks in a local woodland for some years now, and there has been no noticeable affect upon the butterflies. Our local Gloucestershire group also say that although research is ongoing, to date no evidence is forthcoming on the detrimental impact of wild boar upon butterfly populations. 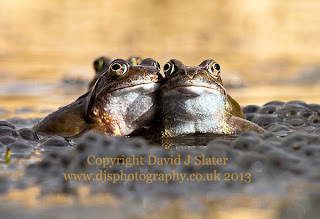 Sadly, here in the Forest of Dean we are now hearing from a new group of amateur reptile and amphibian recorders from GlosARG who are calling for a "management" (a.k.a. cull) of wild boar on the grounds that the boar destroy amphibian and reptile habitats, and more astonishingly, they claim that the eating of frogs, snakes and lizards by wild boar will endanger them! Any good biologist would call this the food chain. We have asked the founders of this local amphibian and reptile group for the evidence of how boar are detrimentally affecting herpetile numbers, but they have responded with simple quotes from "authorities" such as Wikipedia that boar eat frogs, etc. and adders need help! Frogs breed prodigously and amourously because they are predated. As a general rule, the more offspring an animal has is a response to the harshness of it's environment. We feel that playing God by any individual is not the correct way forwards. There is actually a scientific paper that addresses predation of American herpetiles by boars (D. B. Jolley 2010 et al., Journal of Mammalology, 91(2):pp519-524). It studied the stomach content of feral American boar and showed that boar do indeed eat lots of frogs (spade frogs) with less than 10% of the boars' herpetile consumption being anoles (non-venomous tree snakes) and other herpetiles. Anecdotal evidence suggest that boar sometimes "hunt" spade frogs emerging from winter burrows. Maybe true? 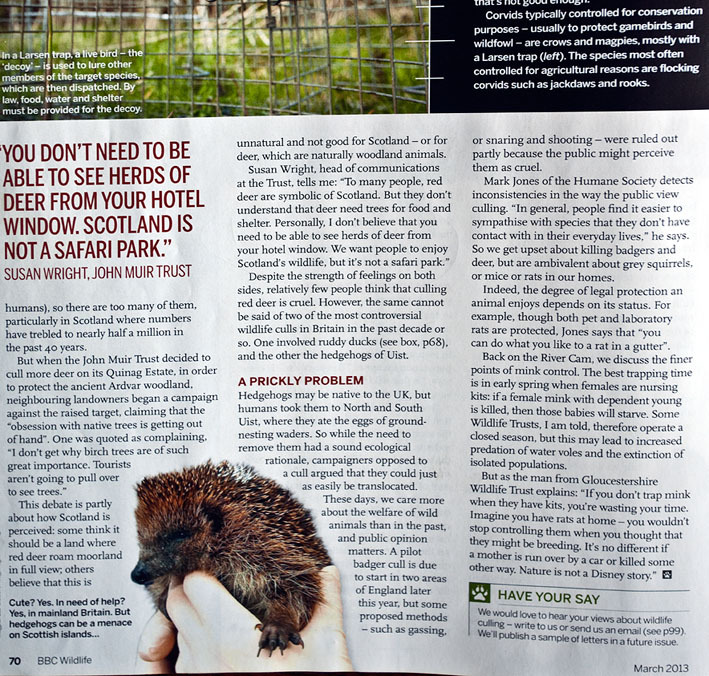 But we are concerned with UK boars and how they inter-relate with other animals here in the UK. Nevertheless, there is now another voice with an emotive and unscientific judgement call to cull the boar. They believe in pre-emptive strikes upon boars and attaining some mythical "balance" between species is called for, and they are promoting this vague viewpoint to the local press and other wildlife enthusiasts (all part of their publicity campaign). Little do they seem to recognise that a multitude of other predators also eat frogs, reptiles and snakes, including some endangered raptors such as Goshawk. Furthermore, the complications rise (with artificial management) when one considers that snakes eat frogs too, not to mention other endangered species such as water voles. What is never highlighted in such predation studies (including even boar predation by wolves) is the obvious fact that stomach contents can be derived from scavenged animals too - the frogs were already dead when eaten! No good scientist utilising "stomach" evidence of a predator or omnivore will ever claim it proves predation of living animals! When did you last eat a live cow or live sheep - but your stomach may well have a lamb chop or steak digesting within! Friends of the Boar have witnessed many times newts and frogs thriving in woodland puddles and even wild boar wallows! Many amphibian species can walk many hundreds of metres in search of new habitat. 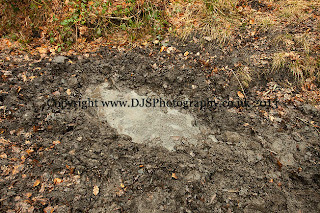 Below are photographs of such a boar wallow with frog spawn. Frog spawn in a wild boar wallow, March 2013. 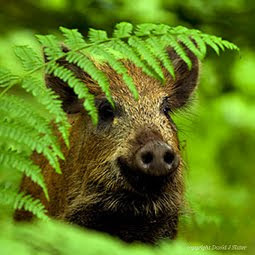 Wild Boar are engineers of biodiversity and ecological balance. 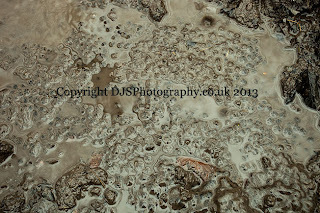 A wild boar had wallowed in this puddle in the last few hours, with some spawn splashed outside the wallow. We observed that the boar had not eaten all the spawn, if any. There was no other pond or water body for maybe 1 mile away. In conclusion, wild boar may very well eat newts, frogs or snakes but does that make those populations threatened? Are they eating dead herpetiles in preference to live ones? Evidence is required before any claim to cull the boars even if the self-styled Utopian vision is a "balance" for nature. We need quantitative evidence that includes reptile populations pre- and post- boar arrivals and qualitative evidence that boar take significant live animals or adversely affect habitats. We don't believe this evidence exists yet. Perversely, however, the wild boar can be proven to create entirely new habitats (a pond or even just muddy ground) for some herpetile populations to thrive, in this case the common frogs' survival and dispersal. Can the boar also achieve some redress to any species population currently overpopulating an environment, given that boar and many other predators have been absent for hundreds of years? How difficult is it to propose that soil mootings of boar create dark patches of warm dark earth exposing invertebrate food sources for herpetiles and also help to warm snakes before a hunt? Has anyone out there any evidence of this? TURF TEAM - Still in Operation! Friends of the Boar have been out and about over the last 4 months actually meeting with real people who have requested help with boar damage to their gardens. We now have a team of about 12 people who will happily visit you if you have a problem with the boar, and we will talk to you about how to possibly prevent a recurrence. Obviously, we will listen to people's views about the boar and respect them. Not everyone's cup of tea to have boar outside your house, but we have found that a reassurance on the unlikeliness of any aggression from the boar is welcoming. Our list of people helped include several individuals, but also Drybrook Rugby Club, The Rising Sun public house in Moseley Green, and Joy's Green Parish Council. Allied to this, we have given talks on the subject in the efforts to spread real information and talk about our experiences when out looking or photographing the boar. We really want to meet people out there rather then just communicate in hyperspace! 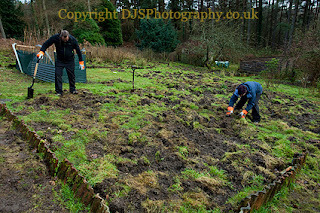 We have had some offers of support and we hope to get some community involvement soon too in helping us repair damage. 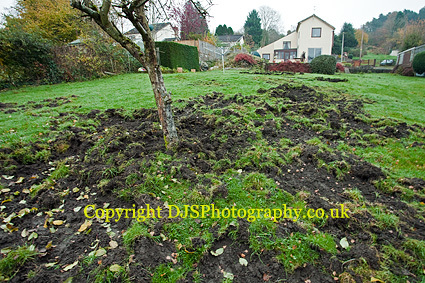 If there are any groups out there who would like to participate in helping repair damage to gardens, meet us, and in the process do a little conservation help for the boar please let us know. It's really not that difficult to repair the grass. Private garden in Pillowell Village, repaired and assistance with boar security. 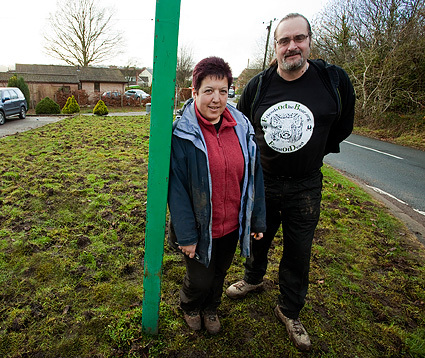 Drybrook Rugby Club, grass banks and roadside repairs. Private garden near brierley in middle of forest. Paths and repairs to garden. 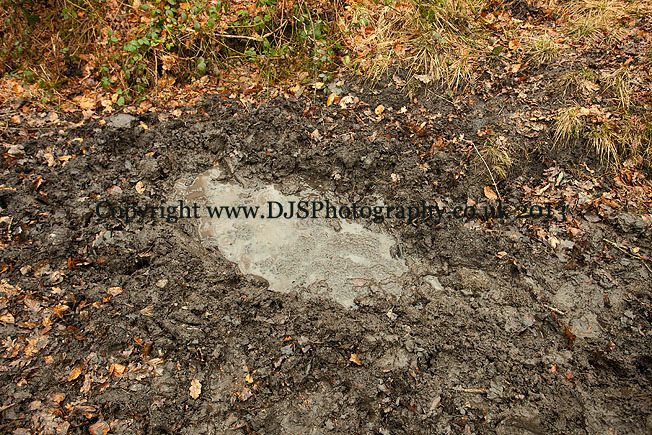 PLEASE NOTE - we have been told by a Highways spokesman that we cannot repair roadsides even if we wanted to, so sorry about that. And before you ask us to repair picnic sites or any other bit of public forest estate, please understand that this is just not feasible for such a small group of volunteers, but we will always try our best. Our focus is on private gardens for the time being. Timely! 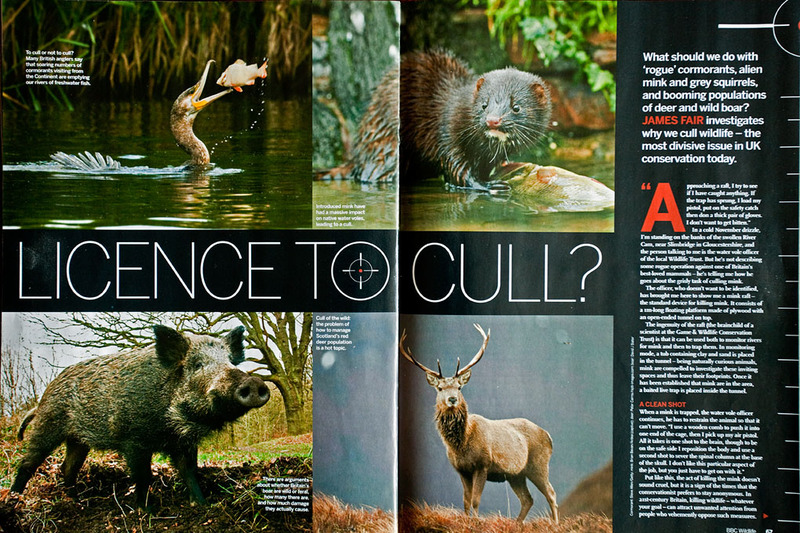 This month's BBC Wildlife magazine (March 2013 vol 31/3) features an interesting article on the Cull Debate for several UK species of animal. Included in the piece is a section on wild boar that we feel you may be interested. Friends of the Boar were interviewed. "At least cormorants have the RSPB to fight their corner. In any discussion of culling, it's noticeable that birds have more friends than mammals. The wild boar of the Forest of Dean, for instance, have just a few die hard activists, in the shape of Friends of the Boar, campaigning to stop an ongoing cull. The differences between this issue and the cormorant one is striking. Though views about how to deal with cormorants may be polarised, there is at least agreement about the impact they're having. In contrast, nobody can even agree what status the wild boar has in Britain. Historically, the wild boar was native, bit it had probably died out here by the end of the 13th century. The animals that have recolonised areas such as the Forest of Dean escaped, or were let loose, from game farms, and are described as "feral" by some (but not all) scientists. So are today's boar native or non-native? Wild or feral? Then there are disagreements over boar numbers. The Forestry Commission says there are more than 600 in the forest of Dean; it wanted to reduce that number to 400. Friends of the Boar says there are only 100-200 animals: quite a difference. There's also the issue of what impact boar have. When they first recolonised, botanists voiced concerns that Britain might lose its bluebell woods. According to David Slater of Friends of the Boar, this has not been the case. "Boar dig up grassy amenity areas, picnic spots and gardens," he tells me, "but not only are they good for forest ecology, they provide wildlife watching and photographic opportunities. The Forest of Dean sorely needs sources of revenue like this." But there are other issues to consider, not least the impact of boar on agriculture. Ian Harvey, the Forestry Commission's wildlife manager in the Forest of Dean, says that one farmer lost £20,000 over 3 years through boar raiding his wheat field. What the government and farmers fear most, however, is the transmission to pigs of diseases such as classical swine fever. Since the Forestry Commission began shooting boar in 2008, the cull target has risen steadily - from 30 in the first year to more than 150 in the fourth - in response to the target species' perceived population increase. 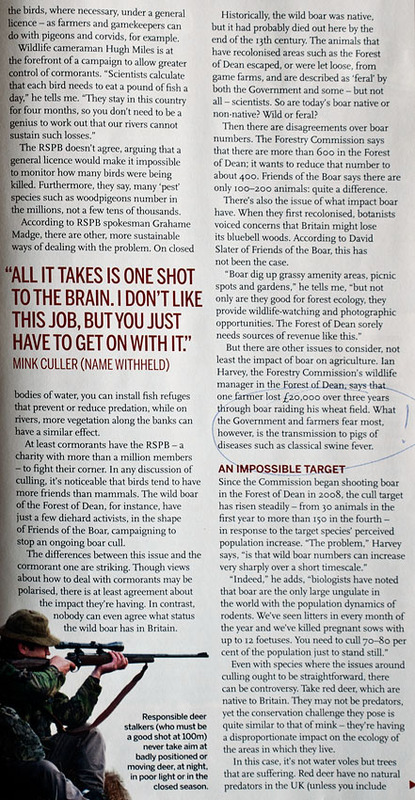 "The problem," Harvey says, "is that wild boar numbers can increase very sharply over a short timescale." "Indeed," he adds, "biologists have noted that boar are the only large ungulate in the world with the population dynamics of rodents. We've seen litters in every month of the year and we've killed sows with up to 12 foetuses. You need to cull 70-80% of the population just to stand still." The rest of the article covers other animals, and if you wish to read it click on the images and hopefully you have good eyesight to read the small print! Friends of the Boar gave answers to many of the questions the author preferred to leave unanswered, such as feral versus wild, and this we will cover in a forthcoming post very soon as promised. We will also post a piece shortly on how the population dynamics cited in this piece is simply a nonsense. 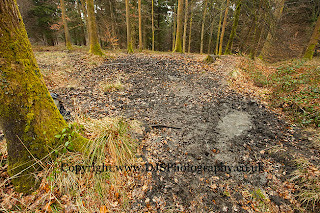 The Forestry Commission met with Friends of the Boar and this topic was discussed. So we are disappointed that Ian Harvey can present such silly population figures to BBC Wildlife. It seems that some people just cannot understand simple maths or concepts, and this now includes one new animal "welfare" group here in the Forest of Dean who now support the Forestry Commission in the promotion of large numbers of boar being culled each year based upon such silly estimates on paper.